St. Paul’s’ Epistle: Construction Progress? The repair is, I think, only a partial success. The narthex entrance facing Mayfair Drive is, or soon will be, once again usable. The barrels, yellow tape, and other signs of construction will soon be but a memory. The new sidewalk is a good match for the paving in front of the church, which is not run-of-the-mill concrete. That the new paving matches the old is positive, of course, but the pristine appearance of the new concrete only emphasizes the poor condition of the older sidewalk, which is uneven, cracked, and pockmarked. The big problem, however, is that the new steps themselves look like they belong on some other building. I objected long before the steps were poured, arguing that it was a mistake to build concrete steps, rather than limestone ones, as are used at the Washington Road and lower Mayfair Drive entrances. (See picture of main entrance at left. 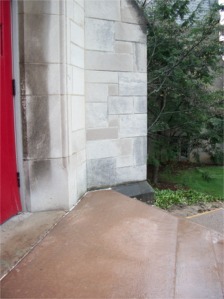 The steps have weathered differently from the walls, but they are clearly made of the same material.) The construction drawings that appeared in the undercroft last year—see “Good News/Bad News—called for the replacement steps to be concrete, with a broom finish, and tinted “to match lower building stone color.” Perhaps the result would have been more acceptable if these instructions actually had been followed, but, as constructed, the steps seem tinted to match the brown tone of the sidewalk, rather than the gray tone of the limestone building. 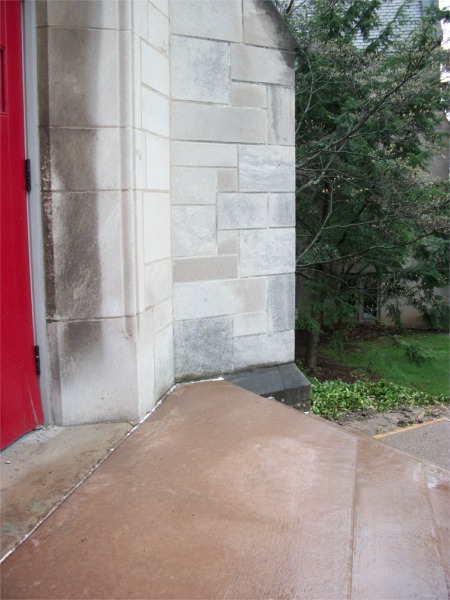 The picture to the left shows just how jarring is the juxtaposition of the new steps and the building proper. Did the contractor make a monumental error? Did someone at St. Paul’s approve a tint that is highly inappropriate? I have no idea. In any case, I have long thought that too much responsibility rests with the Junior Warden. 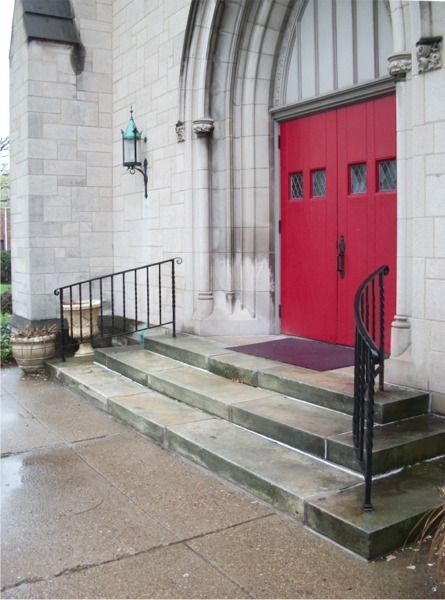 St. Paul’s used to have a Property Commission that allowed for parishioner ideas and opinions to be factored into maintenance, repair, and improvement decisions. That commission, like others at St. Paul’s, no longer functions to engage ordinary parishioners and benefit from their ideas and, in many cases, their expertise. Had I been on the Property Commission considering the repair of the Mayfair steps, I would have asked what our ultimate plans were for the front and side lawns of the building. It would have made sense to consider handicapped access for the front of the church, altered signage, and other related issues. (See “Fulfilling the Vision, Part 4.”) That choices were made concerning the Mayfair entrance to the Narthex with little parishioner consultation and little thought for the future—even implementing the access plan proposed in Fulfilling the Vision would require some demolition of what has just been built—does not lead me to believe that I want the same folks making judgments about how to repair and “improve” St. Paul’s physical plant. 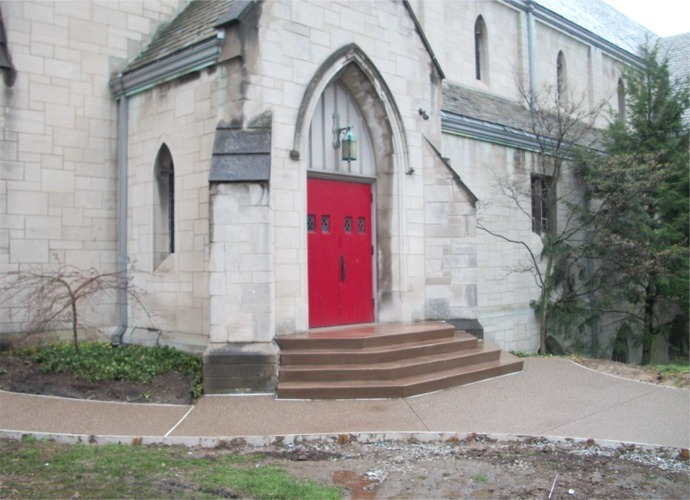 Update, 5:00 PM: I stopped by the church this afternoon and noticed that the new sidewalk does not closely match the existing concrete. It does have visible gravel, but it is lighter in color. When I took the pictures above, it was raining, and the concrete was wet.